// Display the error onscreen and return. 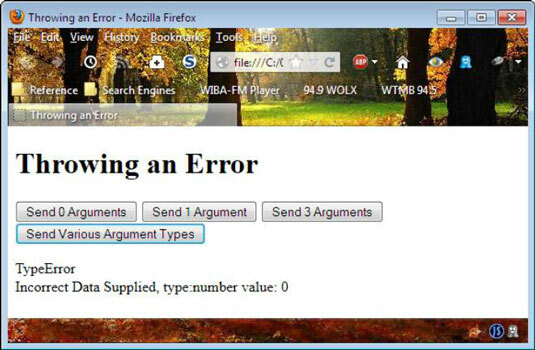 In this case, the example throws specific error types to make it possible for a developer using the function to find problems with input quickly. When the caller doesn’t provide a value or the value is of the incorrect type, the application throws a specific kind of error that tells the caller precisely what went wrong. Always use specific errors when you can. However, you may encounter situations when none of the standard error types meet your needs. In this case, you can create a custom error type. This article describes how to create custom error types. You also find some additional information about the standard error types as part of that article.